Properties in Episcopal Parish of St. Mark and St. John average 4.7 out of 5 stars. Try some adventure or simply relax!!! Property 4: Try some adventure or simply relax!!! Spring into a great place to stay! Property 7: Spring into a great place to stay! Book a week in the summer and receive $100 off . Now through April 30th. Property 8: Book a week in the summer and receive $100 off . Now through April 30th. Beautiful chalet! Pets OK-Game Area-Fireplace-WiFi-Close 2 Slopes! Property 11: Beautiful chalet! Pets OK-Game Area-Fireplace-WiFi-Close 2 Slopes! Book your summer travel today!!!! Property 16: Book your summer travel today!!!! New Beautiful Pocono Chalet, Private Wooded Lot. Property 24: New Beautiful Pocono Chalet, Private Wooded Lot. Treehouse in the woods, with Master loft. Minutes from skiing! Property 25: Treehouse in the woods, with Master loft. Minutes from skiing! Pocono spring special $800 week during Spring break. Dog friendly. 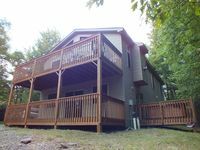 Property 26: Pocono spring special $800 week during Spring break. Dog friendly. BEAUTIFUL CHALET! WINTER DEAL! SKI/TUBE/RELAX 7 MIN TO SKI BIG BOULD/JACK FROST! Property 27: BEAUTIFUL CHALET! WINTER DEAL! SKI/TUBE/RELAX 7 MIN TO SKI BIG BOULD/JACK FROST! 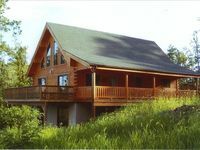 4 Bed Raised Chalet- Dual Living Space, Dual Decks, Perfect For The In-laws! Property 30: 4 Bed Raised Chalet- Dual Living Space, Dual Decks, Perfect For The In-laws! “Family Affair” Lakeside Chalet/500ft to Lake Beach. Spring Special! Property 31: “Family Affair” Lakeside Chalet/500ft to Lake Beach. Spring Special! Lake Harmony Lodge/Gorgeous Lake view/Free Linens/ Sleeps 22! Property 32: Lake Harmony Lodge/Gorgeous Lake view/Free Linens/ Sleeps 22! Come Enjoy the Poconos the way they were meant to be Enjoyed! Property 38: Come Enjoy the Poconos the way they were meant to be Enjoyed! Cozy getaway for a Family Friendly Venue! Only 1 mile away from Wolf Run Lake! Property 39: Cozy getaway for a Family Friendly Venue! Only 1 mile away from Wolf Run Lake! Beautiful Relaxing Chalet over looking georgeous Lake Harmony! Property 40: Beautiful Relaxing Chalet over looking georgeous Lake Harmony! DISCOUNT RATES FOR MAY! YOU WILL NOT BELIEVE WHAT THIS CHALET HAS! Property 41: DISCOUNT RATES FOR MAY! YOU WILL NOT BELIEVE WHAT THIS CHALET HAS! Deer Crossing Summer Getaway - Lake Harmony Estates - Boating Lake - Pets! Property 45: Deer Crossing Summer Getaway - Lake Harmony Estates - Boating Lake - Pets! CIGAR FEST May 3-4th! POOL TABLE, WIFI, FIRE PIT! Close to Lake! Property 49: CIGAR FEST May 3-4th! POOL TABLE, WIFI, FIRE PIT! Close to Lake! We were very impressed and pleased with our stay in Lake Harmony for Easter vacation. The house is beautifully maintained and the beds were so comfortable. We had a rather large group of family and there was plenty of room for all of us with the big rooms and three full baths. Unfortunately it rained during our vacation a lot but there was plenty to do around like Jim Thorpe train rides, wineries and breweries. The kids had so much room to run downstairs and enjoy the playroom while the adults hung out upstairs which we liked a lot. The hot tub was amazing and a huge plus.There was a grocery store pretty close also which was great. The house was very clean and. Functional and we would definitely stay again in the future. Alex was awesome anytime I called he got right back to me. Thanks again! Enjoyed our family weekend. Was a great midpoint destination for us coming from brooklyn, DC and western NY. Comfy house for 12 of us!